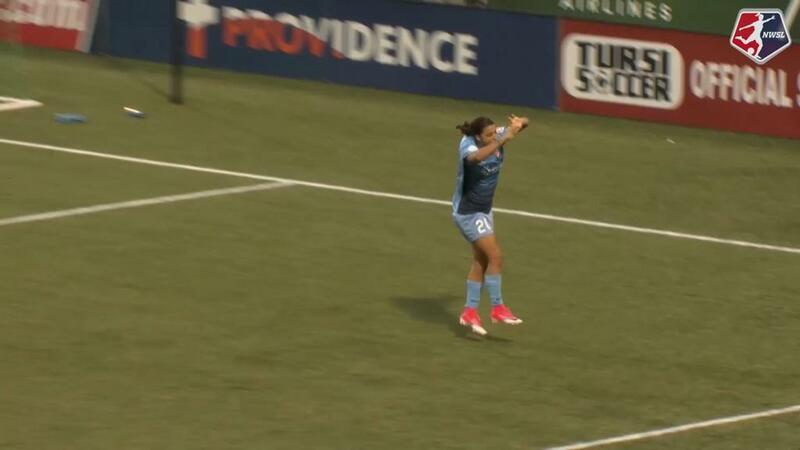 Sam Kerr notched a hat trick in the game’s final 12 minutes as Sky Blue FC stormed back from a 2-0 deficit to win 3-2 at home over an FC Kansas City side playing with 10 after Shea Groom was red carded at the end of the first half. Kerr’s hat trick pulled her into a tie with Megan Rapinoe for the league lead with nine goals this season. It also gave her 35 career goals, moving her two ahead of Jess McDonald for the most goals in NWSL history. The win came in Sky Blue FC’s historic 100th NWSL game, in front of a home crowd of 2,091, as the Jersey side became the first team to reach the mark. It’s the 11th all-time hat trick in NWSL history and the latest start to an NWSL hat trick, with Kerr’s first goal coming in the 78th minute. With FC Kansas City up 2-0, Groom was ejected in the final minute of first half stoppage time after an incident involving Erica Skroski. The play started with Skroski pulling Groom’s left arm from behind. Groom then turned and raised both arms, appearing to make contact above the shoulders on Skroski. After blowing the whistle, referee Amber O’Connor conferred with both assistant referees, Benjamin Wooten and Amilcar Sicaju. O’Connor then issued a yellow card to Skorski and a red card to Groom. The red card means Groom will also be suspended for Kansas City’s next match. Sky Blue FC came out strong in the second half, pressing for the win, which they would get thanks to Kerr’s performance. 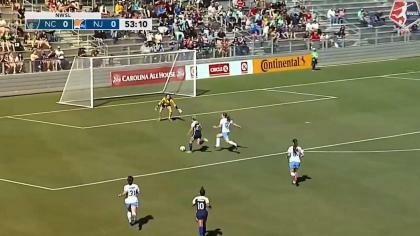 Her first goal came in the 78th minute, a brilliant diving header after a perfect cross into the box from Sky Blue FC defender Kelley O’Hara. Kerr snuck past defender Becky Sauerbrunn to get on the end of the pass from O’Hara, sending her header to the near post and past goalkeeper Nicole Barnhart. Her second goal came just three minutes later, a right-footed shot from about 15 yards out to tie the game. Daphne Corboz threaded it through the KC defense, to the feet of Kerr, who one-timed it past Barnhart to make it 2-2. Sky Blue FC’s win on Saturday night was also a comeback win for the NWSL record books. It’s only the second time in NWSL regular season history that a team has erased a two goal deficit to win a game. The first was September 25, 2016, as Seattle came back from 2-0 to win 3-2 on the road over Houston (though the Reign’s comeback started earlier than Sky Blue’s). It’s also the eighth time in NWSL history that a team came back for a win after trailing with 15 minutes or less to go in the game. The seventh time happened a week and a half ago, also at Yurcak Field, when Orlando scored two late goals in a 3-2 win over Sky Blue. FCKC was also on the losing end in the 2013 playoffs as Portland erased a 2-0 deficit to win 3-2 in extra time. FC Kansas City started the match off strong, with goals from Katie Bowen in the 29th minute and Christina Gibbons in the 42nd, before Groom was sent off. But in the second half, the Blues just could not compete with Sky Blue’s sustained attack. Kansas City’s last shot came in the 53rd minute, followed by 18 unanswered offensive attempts — including Kerr’s three goals — from Sky Blue FC. Sky Blue FC are now 7-6-1 with 22 points. FC Kansas City are now 3-6-4 with 13 points. Match ends, Sky Blue 3, FC Kansas City 2. Second Half ends, Sky Blue 3, FC Kansas City 2. Goal! Sky Blue 3, FC Kansas City 2. Samantha Kerr (Sky Blue) right footed shot from the centre of the box to the bottom left corner. Assisted by Taylor Lytle. Attempt missed. Raquel Rodríguez (Sky Blue) right footed shot from outside the box is too high. Assisted by Taylor Lytle. Attempt blocked. Samantha Kerr (Sky Blue) right footed shot from the centre of the box is blocked. Attempt blocked. Samantha Kerr (Sky Blue) header from the centre of the box is blocked. Assisted by Kelley O'Hara with a cross. Attempt blocked. Daphne Corboz (Sky Blue) right footed shot from outside the box is blocked. Assisted by Kelley O'Hara. Foul by Samantha Kerr (Sky Blue). Desiree Scott (FC Kansas City) wins a free kick in the defensive half. Attempt saved. Samantha Kerr (Sky Blue) right footed shot from outside the box is saved in the centre of the goal. Assisted by Kayla Mills. Substitution, FC Kansas City. Alexa Newfield replaces Sydney Leroux. Goal! Sky Blue 2, FC Kansas City 2. Samantha Kerr (Sky Blue) right footed shot from the centre of the box to the bottom left corner. Assisted by Daphne Corboz. Goal! Sky Blue 1, FC Kansas City 2. Samantha Kerr (Sky Blue) header from the centre of the box to the bottom right corner. Assisted by Kelley O'Hara with a cross. Attempt saved. Maya Hayes (Sky Blue) right footed shot from the centre of the box is saved in the centre of the goal. Attempt saved. Taylor Lytle (Sky Blue) right footed shot from the right side of the box is saved in the centre of the goal. Assisted by Daphne Corboz with a through ball. Substitution, FC Kansas City. Maegan Kelly replaces Katie Bowen. Attempt blocked. Daphne Corboz (Sky Blue) right footed shot from outside the box is blocked. Assisted by Raquel Rodríguez. Corner, Sky Blue. Conceded by Katie Bowen. Substitution, Sky Blue. Leah Galton replaces Erica Skroski. Attempt blocked. Taylor Lytle (Sky Blue) left footed shot from the left side of the box is blocked. Assisted by Kelley O'Hara. Attempt blocked. Daphne Corboz (Sky Blue) left footed shot from the left side of the box is blocked. Raquel Rodríguez (Sky Blue) wins a free kick in the attacking half. Foul by Katie Bowen (FC Kansas City). Attempt missed. Maya Hayes (Sky Blue) right footed shot from the centre of the box misses to the right. Assisted by Raquel Rodríguez. Attempt missed. Sarah Killion (Sky Blue) right footed shot from outside the box is just a bit too high following a corner. Attempt saved. Kelley O'Hara (Sky Blue) right footed shot from the right side of the box is saved in the bottom left corner. Assisted by Samantha Kerr. Attempt missed. Samantha Kerr (Sky Blue) right footed shot from the centre of the box is too high following a corner. Attempt missed. Samantha Kerr (Sky Blue) right footed shot from the centre of the box misses to the left. Assisted by Kelley O'Hara with a cross. Substitution, FC Kansas City. Caroline Flynn replaces Brittany Ratcliffe. Kelley O'Hara (Sky Blue) wins a free kick on the right wing. Foul by Brittany Ratcliffe (FC Kansas City). Offside, Sky Blue. Daphne Corboz tries a through ball, but Kelley O'Hara is caught offside. Attempt missed. Brittany Ratcliffe (FC Kansas City) right footed shot from the left side of the box misses to the right. Attempt missed. Daphne Corboz (Sky Blue) left footed shot from outside the box is too high. Assisted by Maya Hayes. Attempt blocked. Samantha Kerr (Sky Blue) right footed shot from outside the box is blocked. Assisted by Daphne Corboz. Corner, Sky Blue. Conceded by Becky Sauerbrunn. Attempt blocked. Maya Hayes (Sky Blue) right footed shot from the centre of the box is blocked. Assisted by Kelley O'Hara. Corner, Sky Blue. Conceded by Desiree Scott. Attempt missed. Raquel Rodríguez (Sky Blue) right footed shot from outside the box misses to the left. Substitution, Sky Blue. Taylor Lytle replaces Madison Tiernan. Second Half begins Sky Blue 0, FC Kansas City 2. First Half ends, Sky Blue 0, FC Kansas City 2. Shea Groom (FC Kansas City) is shown the red card for violent conduct. Erica Skroski (Sky Blue) is shown the yellow card for a bad foul. Foul by Erica Skroski (Sky Blue). Shea Groom (FC Kansas City) wins a free kick in the attacking half. Attempt saved. Maya Hayes (Sky Blue) header from the centre of the box is saved in the centre of the goal. Assisted by Kelley O'Hara with a cross. Attempt blocked. Brittany Ratcliffe (FC Kansas City) left footed shot from outside the box is blocked. Goal! Sky Blue 0, FC Kansas City 2. Christina Gibbons (FC Kansas City) right footed shot from the right side of the box to the top left corner. Assisted by Desiree Scott. Attempt blocked. Shea Groom (FC Kansas City) right footed shot from the right side of the box is blocked. Assisted by Sydney Leroux. Attempt blocked. Brittany Ratcliffe (FC Kansas City) right footed shot from outside the box is blocked. Attempt missed. Desiree Scott (FC Kansas City) right footed shot from outside the box misses to the right. Assisted by Christina Gibbons. Attempt blocked. Christina Gibbons (FC Kansas City) right footed shot from outside the box is blocked. Attempt saved. Rebecca Moros (FC Kansas City) left footed shot from the centre of the box is saved in the bottom left corner. Attempt blocked. Becky Sauerbrunn (FC Kansas City) right footed shot from the left side of the box is blocked. Corner, FC Kansas City. Conceded by Christie Pearce. Sydney Leroux (FC Kansas City) wins a free kick on the left wing. Goal! Sky Blue 0, FC Kansas City 1. Katie Bowen (FC Kansas City) right footed shot from outside the box to the bottom left corner. Assisted by Christina Gibbons. Substitution, Sky Blue. Kayla Mills replaces Mandy Freeman because of an injury. Delay in match Mandy Freeman (Sky Blue) because of an injury. Mandy Freeman (Sky Blue) wins a free kick in the defensive half. 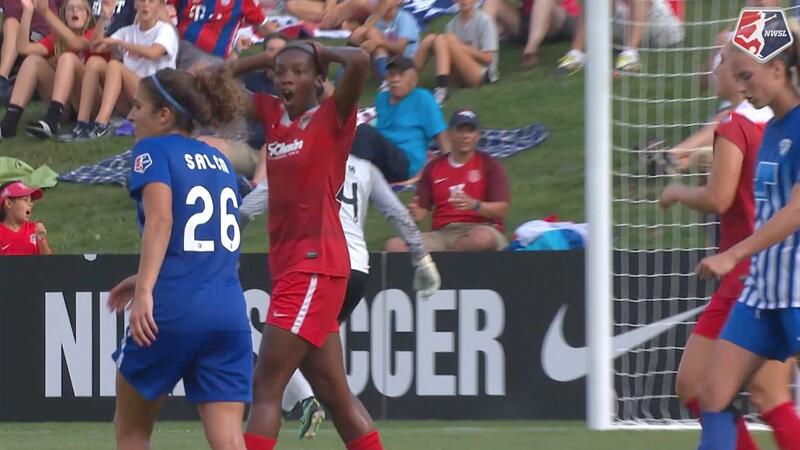 Foul by Shea Groom (FC Kansas City). Hand ball by Maya Hayes (Sky Blue). Attempt missed. Brittany Ratcliffe (FC Kansas City) right footed shot from outside the box misses to the right. Offside, FC Kansas City. Christina Gibbons tries a through ball, but Sydney Leroux is caught offside. Attempt blocked. Brittany Taylor (FC Kansas City) right footed shot from outside the box is blocked. Assisted by Christina Gibbons. Attempt saved. Kelley O'Hara (Sky Blue) right footed shot from outside the box is saved in the centre of the goal. Assisted by Raquel Rodríguez. Hand ball by Christina Gibbons (FC Kansas City). Attempt saved. Desiree Scott (FC Kansas City) right footed shot from outside the box is saved in the centre of the goal. Attempt missed. Kelley O'Hara (Sky Blue) right footed shot from outside the box is just a bit too high from a direct free kick. Hand ball by Rebecca Moros (FC Kansas City). Attempt blocked. Sarah Killion (Sky Blue) right footed shot from outside the box is blocked. Samantha Kerr (Sky Blue) wins a free kick in the attacking half. Attempt missed. Katie Bowen (FC Kansas City) left footed shot from outside the box is high and wide to the left. Corner, FC Kansas City. Conceded by Erica Skroski. Attempt blocked. Shea Groom (FC Kansas City) right footed shot from a difficult angle on the right is blocked. Assisted by Katie Bowen. Attempt blocked. Sarah Killion (Sky Blue) right footed shot from outside the box is blocked. Assisted by Maya Hayes. Foul by Christina Gibbons (FC Kansas City). Sarah Killion (Sky Blue) wins a free kick in the attacking half. Corner, FC Kansas City. Conceded by Kailen Sheridan. Shea Groom (FC Kansas City) wins a free kick on the right wing. Attempt missed. Madison Tiernan (Sky Blue) header from the centre of the box misses to the right. Assisted by Kelley O'Hara with a cross. Attempt saved. Sydney Leroux (FC Kansas City) left footed shot from outside the box is saved in the bottom left corner.